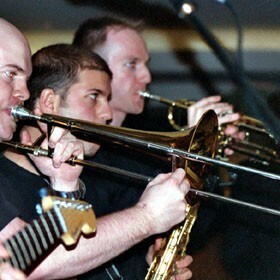 Funkology can provide a 2 to 9 piece band playing jazz, swing, disco and soul covers. Available for private or public events with full PA and lighting system. “The band was great! The broad range of music you played was exactly what we wanted for our event, and certainly got the audience on the dancefloor..."
“Thankyou SO MUCH for a really fantastic night! 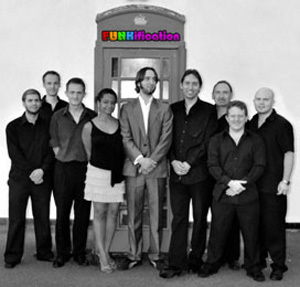 Everyone was so impressed by the sound you made and the wide variety of music you played..."
The Funkology function band has up to 9 musicians playing high-energy funk, soul, disco, rock, pop and jazz. Up to a 9 piece band playing high-energy funk, soul, disco, rock, pop and jazz. If you want the hottest professional band on the London circuit, playing classic funk, soul, disco and pop grooves to keep you dancing all night long, then you’ve come to the right place! The Band – FUNKology is an outstanding wedding and corporate function band with a huge 9-piece sound that is second-to-none! The band has an excellent pedigree, with members coming from West End shows, The Guildhall School of Music and The National Youth Jazz Orchestra, ensuring live music of the highest quality! The Music – A night of grooving with FUNKology would usually be ignited by the legendary soul classics from the likes of Aretha Franklin, Otis Redding and James Brown. The evening would continue to burn with funky sounds from the likes of Stevie Wonder, Kool & The Gang and Tower Of Power, with a final explosion of disco beats from Chic, The Jacksons and Earth, Wind & Fire, to name but a few. The Gigs – The band is available for bookings at any type of public or private event and has years of extensive experience in the professional music scene. Other musical options are also available as great value all-in-one packages. Options: Full party / function band (5 to 9 players), Jazz Ensemble (2 to 9 players), Swing Band (9 players), Brass Ensemble (2 to 5 players), Cocktail Pianist, Trumpet Fanfare, disco music between sets. Full PA system & lighting (including disco lights & smoke machine if necessary). London based. UK, Europe & Worldwide coverage. Other info: Full Musician’s Union public liability insurance. All band equipment PAT tested. This is just a small selection of comments from some of our very happy past clients.